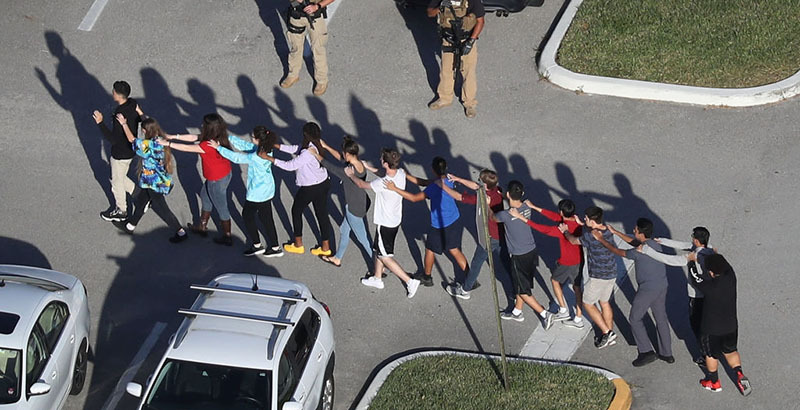 In one of the deadliest school shootings in U.S. history, 17 people were killed and 15 were wounded after a former student opened gunfire in a southern Florida high school Wednesday afternoon. The incident unfolded at Marjory Stoneman Douglas High School in Parkland, Florida. The campus is part of the Broward County School District, America’s seventh largest. Student witnesses reported that a fire alarm went off in the school about 10 minutes before the end of the school day Wednesday. The gunman opened fire as students began to evacuate, part of what authorities believe was a calculated attempted to maximize casualties. The Broward County Sheriff’s Office first tweeted about the incident at 2:53 p.m. Wednesday. How many students were injured or killed? Seventeen people were killed, Broward County Sheriff Scott Israel confirmed during a press conference Wednesday evening. Students and adults were among those killed, though it remains unclear if any of those adults were teachers. Twelve were killed inside the school, two just outside the building, one on a nearby street corner, and two died in the hospital. An additional 15 others were wounded. How did the superintendent respond? Today we experiencing the worst of humanity as an unspeakable tragedy has hit our @browardschools family at Marjory Stoneman Douglas HS. There has been a shooting on campus with injuries and fatalities. We are working with law enforcement as we pray for our babies and families. Police say the suspect is 19-year-old Nikolas Cruz, a former student who had been expelled for disciplinary issues within the past few years. He was taken into custody in nearby Coral Springs without additional incident. Parkland is an upper-class community in Broward County, Florida’s second most populous county. Fort Lauderdale is the county seat. About 3,000 students are enrolled at Marjory Stoneman Douglas High School. What kind of weapon was used? Police recovered an AR-15 semiautomatic rifle and multiple magazines from the scene. What was the shooter’s motive? The shooter’s motive remains unknown. Israel said investigators have begun to scour Cruz’s social media accounts, which included “very, very disturbing” content, though he didn’t elaborate further. Wednesday’s shooting is the 11th incident in 2018 in which someone was shot and injured or killed in a K-12 school or university. It is the deadliest school shooting in the U.S. since 2012, when 26 people were killed at Sandy Hook Elementary School in Newtown, Connecticut — and worse than the massacre at Colorado’s Columbine High School in 1999 that left 12 students and one teacher dead. This map includes school shootings that took place on campus where a person was injured or killed. Incidents resulting in injury are labeled blue, while incidents resulting in death are labeled red. The most recent incident is indicated with a larger icon. Nationally, nearly 1,300 children (17 years old and younger) die from gunshot wounds each year, and 5,790 are treated for injuries, according to a recent Centers for Disease Control and Prevention report. While unintentional firearm deaths and homicides of children have decreased in recent years, suicides have spiked. Among child gun deaths between 2012 and 2014, 53 percent were homicides, 38 percent were suicides, and 6 percent were unintentional. Less than 3 percent of youth homicides and less than 1 percent of youth suicides occur at school, according to a recent report by the National Center for Education Statistics.